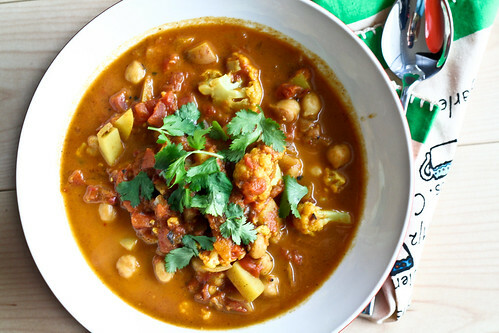 Another recipe from this month’s glossies, prescription I found this Curried Cauliflower and Chickpea Stew in the May issue of Bon Appetit. Curry? Coconut milk? Cilantro? Yes please! I made this one morning before work and it came together in under 30 minutes. It’s a little spicy, a little earthy and really flavorful. I love the combination of coconut milk and curry powder with the chickpeas and cauliflower. It just tastes like homey comfort food, which is just perfect for a long day at work. This is one of those dishes you can make once and eat all week for lunch or dinner. Served over Jasmine rice, you’ve got yourself a really healthy and delicious meal. *I used Muir Glen, but use regular diced tomatoes and add green chiles or cayenne pepper if you can’t find these. Set a large pot over medium heat and heat the olive oil. Saute the onions for 5 minutes, or until just soft then add the potatoes and curry powder. Give everything a good stir. Add the tomatoes, chickpeas, cauliflower, coconut milk and salt. Bring to a simmer and reduce the heat to medium-low. Simmer for about 20 minutes. Taste and adjust the salt as needed. Serve over Jasmine or Basmati rice (I buy pre-cooked frozen Jasmin rice from Whole Foods), then top with cilantro. This is just so perfect for weekday meals! Thank you – it’s now bookmarked! Nice recipe Mel. I get Gourmet and Food & Wine. Have not subscribed to Bon Appetit. What do you think of the magazine? I an almost identical meal at a local vegetarian restaurant yesterday. Hmm, the chef must have been inspired by the same recipe. It was absolutely fantastic! Nice. Love how your recipe lists are never too long. This is fast and easy. My, this looks delicious. Everything about it is tasty — can’t wait to try it! Oh, I like the idea of this a lot! thanks for the tip about your curry supplier. I’ve been following your blog for a while now–can’t quite remember how i first found it! tastespotting, perhaps? your recipes never disappoint. This one looks particularly delicious. I made this last week, it was great, very simple and yet tasty. Next time time I make it I’ll try adding some additional spices, such an earthy dish can easy carry a more complex flavour, I think. Thanks for the recipe!